HOLLYWOOD - In a recent interview with GQ magazine Tom Cruise said he plans to eat his baby's placenta. When he was cautioned that placentas weigh approximately one sixth as much as the babies to whom they are attached, Mr. Cruise became combative. "You don't know placentas," said Mr. Cruise. "I do. I've studied placentas. I know dozens of ways to prepare them. I know what wines go with them. What do you know?" According to Mr. Cruise, the recipes for serving placenta of which he has firsthand knowledge range from placenta tartare to placenta meat loaf. Mr. Cruise said placenta "reminds him of veal, but with a springier texture like heart." The benefits of eating placenta, he said, include reduced hemorrhaging and a decrease in the likelihood of postpartum depression. Placenta tartare, which preserves the greatest amount of the placenta's nutritional content, is prepared by mixing the following ingredients thoroughly: one pound of finely ground placenta, one teaspoon of brown mustard, one-half teaspoon of Tabasco sauce, one teaspoon each of Worcestershire sauce and brandy, one egg, a pinch of salt, and ground white pepper to taste. Refrigerate half an hour to allow the flavors to blend, then serve as a spread on crackers or toast accompanied by any wine with a subtle red-meat aroma, such as a cabernet sauvignon or merlot. If the idea of eating raw placenta leaves you cold, said Mr. Cruise, there are numerous methods for cooking placenta. One of the simplest is placenta aglio, olio e peperoncino (placenta in garlic, olive oil, and pepper). Gently blanch one pound of placenta that has been cut into one-quarter-inch-thick discs. 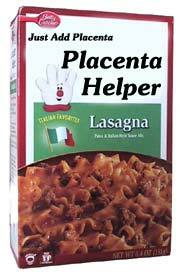 After blanching the placenta for no more than thirty seconds, drain and set aside in a deep-heated serving dish. Heat one cup of extra virgin olive oil in a pan. Add three to four cloves of crushed garlic and one hot chili pepper pod. When the garlic cloves begin to brown, discard them or they'll overwhelm the flavor of the placenta. Pour the olive oil over the placenta. Sprinkle with black pepper and one teaspoon of chopped Italian parsley. Stir well and serve immediately with fresh-baked crusty Italian bread and a sweet white wine. Mr. Cruise said his favorite placenta recipe is placenta meat loaf. Begin by chopping one onion and combining it with one teaspoon of black pepper and one sleeve of crushed saltines. Then combine one pound of ground placenta with the onion, pepper, and saltines. Add one teaspoon of bay leaves, one teaspoon each of white and black pepper, a clove of roasted and minced garlic, and one cup of chopped tomatoes. Mix well. Place in a buttered loaf pan, cover, then bake in a preheated oven at 350 degrees for an hour and a half, occasionally pouring off excess blood. Serve with smoky wines such as Barolo or Barbaresco. In addition to these recipes, Mr. Cruise mentioned others "that highlight the placenta's versatility." They included placenta smoothies and placenta jerky, retro-favorites like placenta Wellington and placenta under glass, and "that week night favorite," lasagne Placenta Helper.